Curtis Emerson prepares to pump 40 gallons of oil into the house of a family on heat assistance in Ellsworth on February 1, 2011. The heating program for low-income households delivered about $22 million to Mainers last year, giving an average of $546 for the year to the 40,221 households that received benefits under the program. 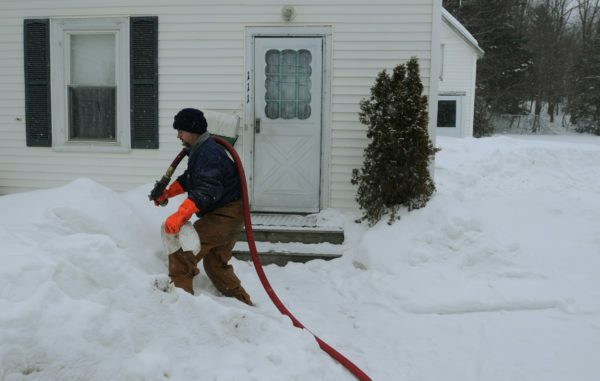 It gave the most out in Bangor, Lewiston and Skowhegan, according to figures from the Maine Housing Authority. Trump’s budget proposal says the program “is unable to demonstrate strong performance outcomes,” putting it on the chopping block alongside a raft of programs his administration identified as underperforming. Maine’s plan targets populations most susceptible to hypothermia, primarily elderly residents and young children, with about 60 percent of the funds helping people pay heating costs. “The attorneys general and advocates argue that without this vital assistance, many of these families would be faced with the impossible choice of opting between heating and cooling their homes, and paying for other necessities, such as food and medications,” their offices said in a joint statement.